Providing research, analysis and tools to improve public services is the core of what we do at OCSI. Currently we are heads down working on updating the Indices of Deprivation for Department of Communities and Local Government, due to be published in July this year. Organisations across the UK will be waiting eagerly for the release, as it is used to target upwards of a billion pounds each year. Last week we were lucky enough to have the folks from Islington Play Association join us for sandwiches to tell us about their work and to elaborate on how they use Indices of Deprivation in their work. While Islington has a reputation of being a trendy place to live & socialise, it is the 5th most deprived borough in London (behind Hackney, Newham, Tower Hamlets & Haringey), with more than one in three children living in poverty. It is both the smallest borough at just over 6 square miles and also London’s most densely populated. Despite all these people, Islington lacks open space and parks and most people’s homes have no garden. Map from Local Insight showing levels of children in poverty in Islington. 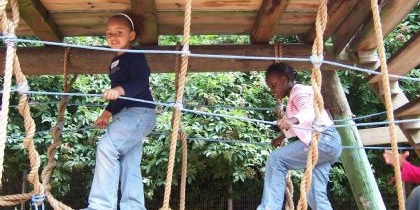 These challenges reinforce the importance of Islington Play Association’s work in the borough. Set up in 1971, Islington Play Association is a play charity, working under the ethos that ‘all children and young people need to play.’ Islington Play Association run 6 of the borough’s 12 adventure playgrounds (the remaining 6 are directly run by Islington Council). All of the playgrounds do not charge and are free for all children to use, both after school and during school holidays – providing an important source of childcare for many families in Islington. The adventure playgrounds are more than just a care provider though; they provide an open, safe & creative space for children to explore the world around them. In recent years the number of adventure playgrounds across England have been falling, but Islington are bucking the trend. This is where the Indices of Deprivation comes in as an important tool. As there are pockets of extreme wealth located right next to pockets of deprivation, detailed small-area data like the Indices of Deprivation can help make the case for continued funding. The Indices of Deprivation looks at unmet needs caused by a range of factors – not just financial. The ranking in Indices of Multiple Deprivation is the result of in-depth statistical analysis across seven domains that can be analysed separately to get a better handle on specific forms of deprivation, or together to measure a broader concept of multiple deprivation. Islington Play Association use this evidence in their funding bids alongside the rich qualitative data they gather from their playgrounds. It is so easy to get caught up in what you are working on, that you sometimes forget that the story doesn’t end with you. It was fantastic to hear how the Indices of Deprivation helps Islington Play Association and other community organisations to continue their work and we look forward to more conversations like these!